All our MLM letters have one goal: to generate a phone call… and make this introduction. In fact, every letter in our network marketing letter series has ONE GOAL: To Generate Phone Calls. If you offer network marketing or MLM programs and products through the mail or online – and if you’d like to have people call you – this set of network marketing sales letters is perfect for increasing your phone calls—and your business. Say “Hello” to warm leads: people will call you interested in your products and programs! 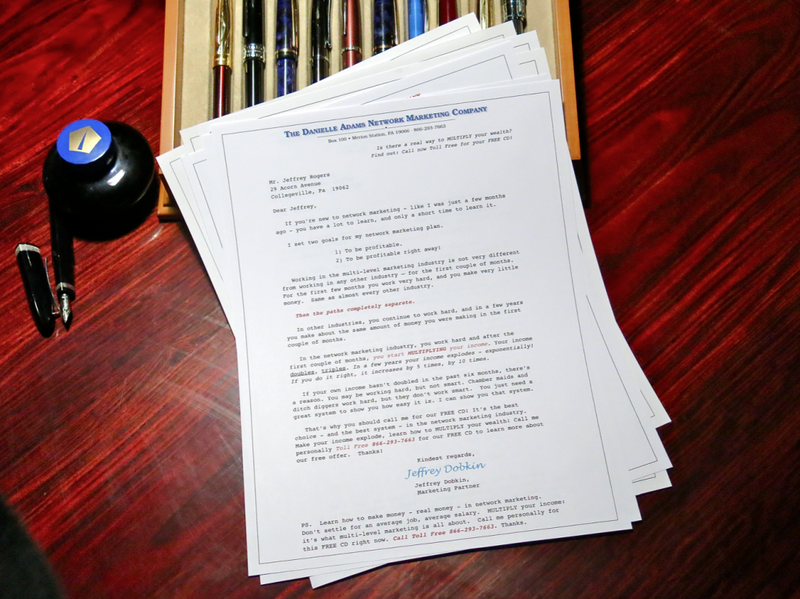 Order NOW — Get all 25 Awesome Network Marketing Sales Letters — Just $59! Cost is under $3 per letter! Get Instant Access to all letters – with Immediate download! Be in the mail in just a day or two — right from your own home computer. Need more information? Call us: 610-642-1000. Your call is welcome. Click here for Detailed Letter Descriptions! And Get 10 more of our newest Network Marketing Sales Letters included FREE! This full series of letters will change your Network Marketing Strategy… for life! Call for FREE CD! — Offers a FREE CD or free audio file if readers call! · I’ll never spend another Christmas like this! The most powerful Christmas Letter ever written. Mail from Nov 1, through Jan 31! · Do you take Vitamins? — Generates calls by offering a repeatable, scalable income through your vitamin or supplement program. · Need an Extra $10,000? — A most powerful letter that generates phone calls with solid reasons your network marketing program will explode the reader’s income. · Stress: Call for FREE Audio — Offers to reduce stress in readers lives if they just pick up the phone and call you now! · Stress: Contains Audio file for letter or web. — Have readers click, call, visit your website, or sign up for your email. · What Doctors don’t tell you – Why doctors only offer you pills when you are sick… while your program offers readers wellness — and how to stay healthy (vitamins/supplements)! · Multiply Your Income! — The difference between working-hard and working-smart. How MLM can multiply your income. · Call for Recorded Message – This letter powerfully recommends the reader call to listen to your 2 minute recorded message. · Order now and get a FREE 2-Minute Phone Script! — This hard-working marketing letter generates low stress calls from readers by offering them a chance to listen to your non-threatening recorded message. Want More? See more Letter Descriptions here! so you can speak with people who are already interested in you and your programs! Letters come fully formatted in Word! We don’t just send you the raw copy and say ‘Hey, good luck with that!’ All our letters are wonderfully styled and fully graphically designed. They’re completely ready for you to print on your letterhead and mail. Order NOW and receive all our newest letters included in your order – FREE – just by ordering now! You’ll get an immediate download of all 25 letters! If you have questions, call us. We’re real people and always happy to help. Calls are not outsourced to a foreign land, our business is located in the good ol’ USA, right outside of Philadelphia, Pennsylvania. Go on – call us at lunchtime, see if our mouths are full… Please let us know if we may help you in any way or if you need anything else, not found on our website. Questions? Comments? We love them – Call 610-642-1000. Thank you! We appreciate your questions. 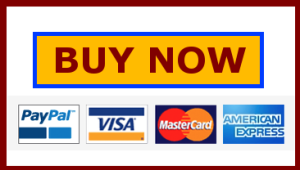 Clicking “Buy Now” will take you to PayPal, where you can securely use your PayPal account or any credit card. Letters are for your own personal and exclusive use. Sorry – not for resale to your affiliates or downline, or for their re-use. Please contact us for information about a multi-license use so your entire team may all mail these letters, too! YES! Send me your awesome set of Network Marketing Sales Letters! Just $59 for the entire set. Click Here! Get Started Today — Click Here to order!